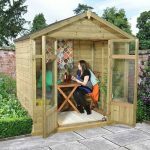 The Hartwood 6′ x 6′ FSC Pressure Treated Sutton Overlap Apex Summerhouse is perfect for those of you who have a garden that is a little short on space, do not have a large budget, but still want a fun and charming place to kick back and relax. This is one of the more compact summerhouses out there and it has been designed so that it will fit into even smaller gardens. It has a lovely look with the front of the summerhouse having a large single door and also three windows so that you can sit back and watch the world go by. 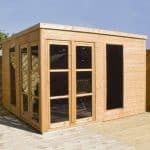 Considering the very reasonable price, this summerhouse is still made with some very impressive materials. The cladding used is 7 mm thick, overlap cladding which has a great look and is also very strong and able to deal with even the worst rain. A robust frame is joined to the cladding and this is what makes the summerhouse such a strong and long lasting structure. Solid sheet boarding is used for both the floor and the roof and this is a great way to have a strong roof and floor, but without increasing the price to a point where it makes your wallet cry. You might also like to see the top 20 cheap summer houses currently on sale in the UK by visiting the WhatShed cheap summer houses awards league table. 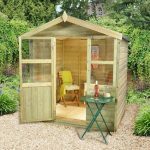 The charming and snug Hartwood 6′ x 6′ FSC Pressure Treated Sutton Overlap Apex Summerhouse is the kind of garden structure that just makes you saw aww. It has a very compact size to it which makes this the ideal summerhouse for those of you who do not have large gardens or even a large budget to purchase something like this. Now this is one of the smaller summerhouses we have seen with the width being 6 feet 6 inches and the depth 6 feet 8, but this is still more than enough space to fit in a chair, little table and if you really want to live the dream, a small TV so you can kick back in style after a hard day’s work or just have a little quiet space to enjoy the match. The summerhouse is actually taller than the pictures suggest as even at the eaves there is 5 feet 9 inches of headroom which is a couple inches taller than we expected. Along the ridge you have a very impressive 6 feet 11 inches so while you will be spending most of your time sitting down with a glass of wine or beer in your hand it is good to have this spacious headroom. The apex roof is made with solid sheet boarding and then covered up with this very attractive looking sand felt. One of the best things about this apex roof is the way that the rain will always run down the sides of the summerhouse thus preventing it from always running down the front. We have not seen too many summerhouses that make use of overlap cladding so this is a breath of fresh air. It gives the summerhouse a more rustic and cabin in the woods type of look which you cannot get with tongue and groove cladding. This is 7 mm thick which is a little slimmer than we are used to seeing, but we really do not see it being a problem as this type of cladding is very roust in its nature. The cladding is not on its own though, as it is backed up with a very strong frame that is 28 mm x 28 mm. While on its own merit this frame is very strong and well made, it is actually the way that the cladding joins to the frame which makes this such an impressive summerhouse. It makes for a summerhouse that simply does not offer any kind of crevasses for rain to get into the summerhouse. The flooring is made with solid sheet boarding which to be fair is what we expected to see given the price of the summerhouse, but while this type of boarding is more than strong enough to handle a couple of chairs, table and other items, we do wish that they had maybe gone that extra mile and had some tongue and groove boarding as it looks just so much more appealing. The most surprising aspect of this summerhouse is that all of the wood is pressure treated. At this price point this is actually rather unusual, not that we are complaining of course as this means that you do not have any worries about any rot or decay appearing. Also it means that you do not have to get the paintbrush out and treat the summerhouse once a year. The Hartwood 6′ x 6′ FSC Pressure Treated Sutton Overlap Apex Summerhouse comes with a 15 year guarantee that covers you against rot and decay. There is only a single door on this summerhouse, but that just adds to its compact charm and style. We really like the way that there is a good sized window on the door. The door is actually really well made and with those strong hinges you do not have to worry about it sagging or breaking when one of the kids slams it shut. On the front of the summerhouse there are another two windows located on the front. So including the one that is on the door, natural light is just going to flood into the summerhouse. All of the windows are made from shatterproof styrene that is 1.2 mm thick and that is fine with us. If we were to nit pick a little bit, we would say that at least one window on one of the sides or the back would have been a welcome addition. 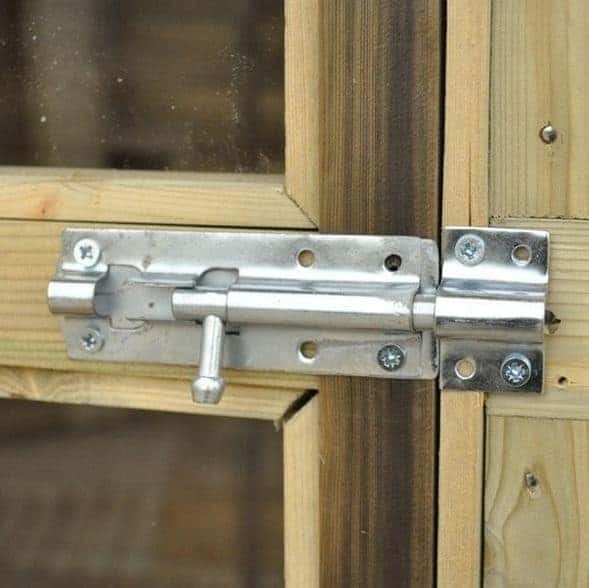 A very sturdy pad bolt is on the door so you can really make sure that the door will not be swinging open and banging closed in the window. If you were to have something like a TV inside here then adding some kind of lock, even something as simple as a padlock, would be worth thinking about. As far as privacy goes it all depends on where you place the summerhouse in your garden. You could always position it so that the windows are not facing the street or where the neighbours can easily see, but if this is not an option then we feel that some blinds would give the summerhouse a bit more style and give it more of a homely look. 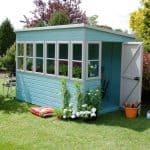 This is a very charming summerhouse and we are sure that no matter if you were to paint it a brighter colour, darker colour or even just leave it the way it is, you are going to love the way it looks in your garden. Most of the customisation that you will be doing with this is all on the inside and that to us is the way that a summerhouse should be. 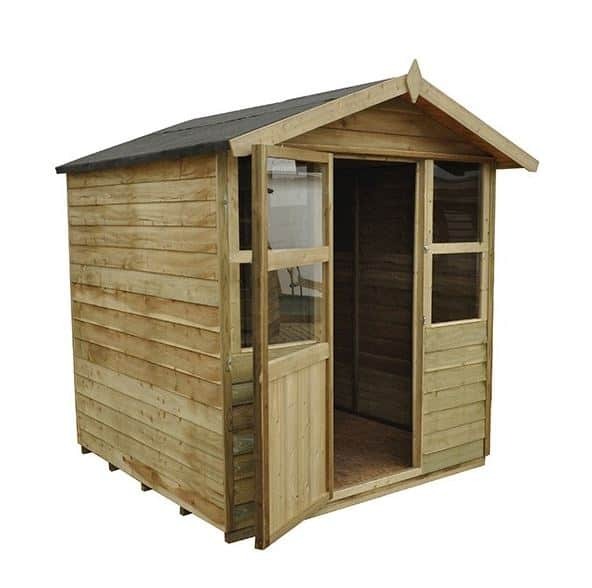 There is only one extra that you need to consider with this summerhouse and that is the plastic shed base. 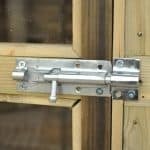 If you are installing the summerhouse on grass then this is something that will stop the summerhouse from sitting right on the grass and also help make the floor that little bit more stable. 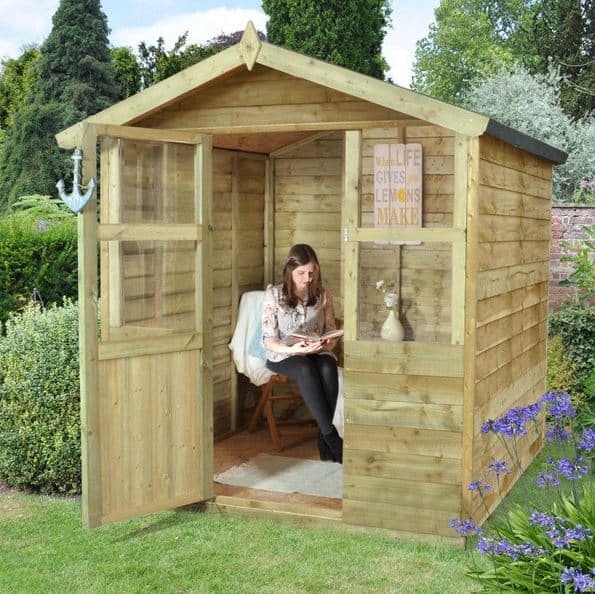 It is a little pricey at £95.99, but it is worth considering if you do have some concerns over the area of your garden you will be installing the summerhouse. While we would have really liked to have seen some tongue and groove boarding, the summerhouse for the most part is very high quality considering the low price. You are going to be able to enjoy many glasses of wine inside here over the 20 plus years you are going to get out of this. The summerhouse is well designed and the wood being pressure treated really is going to make this last a long time. This is certainly one of the smaller summerhouse that we have seen and while that is part of its charm, you are going to have to really think long and hard about what you are going to put in here. 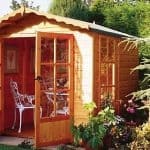 While you will need someone to help you install the summerhouse, we do not see this taking you any more than 4-6 hours. 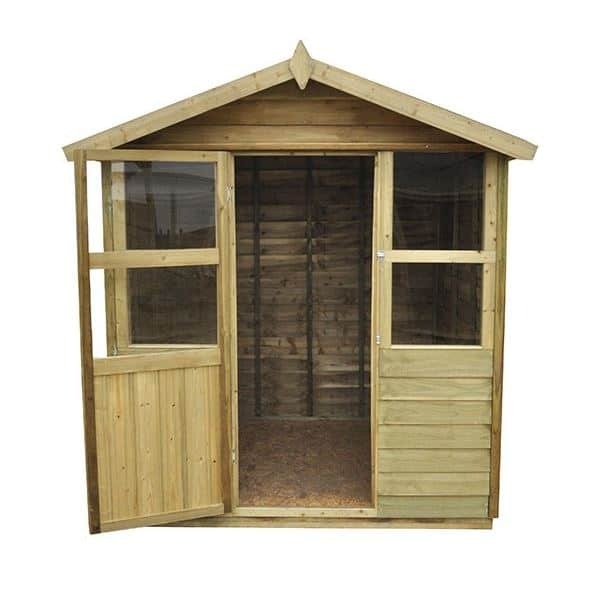 At just over £400, we feel that this is a summerhouse that is very good value for money, even though it is on the small side. 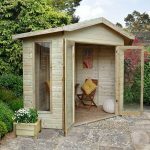 Final Thoughts: This is one of the smallest summerhouse we have seen and at the price they are asking for it, the Hartwood 6' x 6' FSC Pressure Treated Sutton Overlap Apex Summerhouse is also one of the cheaper ones on the market. It is very impressive what they have done here and if your own little space to call your own where you can get away from it all is what you are after then we are sure you are going to spend many hours inside here. While not ideal if you want a large space to relax in, we still think this is one fantastic summerhouse and will serve you well for many, many years.